From Thursday 23 November 2017 until Tuesday 30 April 2019: Enjoy 40 % off! 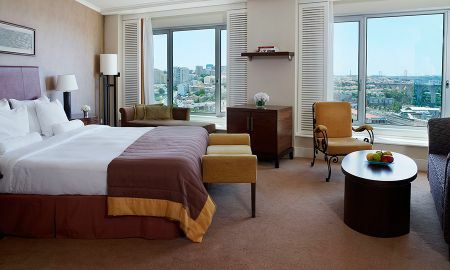 Style and modernity conveniently located in the heart of Lisbon's financial district, the Corinthia Hotel Lisbon is a landmark of the city. 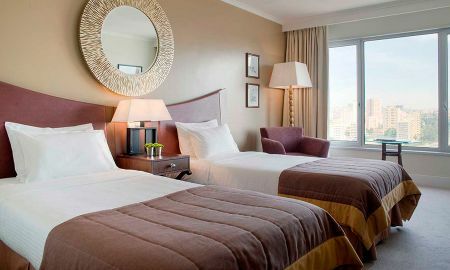 Comfort and detail were put into the design of the 518 guestrooms complemented by the Executive Club top level rooms and suites, featuring direct access to the Executive Club Sky Lounge with special privileges. 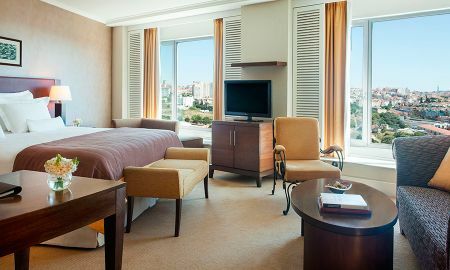 The property's holds the largest congress centre in a five star hotel in Lisbon with a total of 15 rooms all with day light with private entrance from the outside street. From leisurely to al fresco breakfasts to formal fine dining, the 2 restaurants, Típico and Sete Colinas and the Tempus Lounge Bar lead you to discover the best of Portugal's exquisite flavours. The enticing Terrace Garden offers a relaxing mood and during Spring and Summer becomes a splendid setting for lunch or a cocktail while enjoying the mild weather and Sun. After business or sightseeing, the Spa at the Corinthia Hotel Lisbon devoted to wellness and sensory exploration providing the ideal ambience to unwind. The Corinthia Hotel Lisbon is a stylish destination at the centre of the financial district. Only steps away from the Lisbon Zoo the Calouste Gulbenkian Museum and the most upscale shopping areas. Its proximity to the metro, with a 10-minute ride into the historic centre, makes it an ideal base for both leisure and business. From the 1st of May 2015, Pets will no longer be allowed in the Hotel. The Hotel no longer features Smoking Rooms nor allow smoking indoors. Within the Hotel premises, only at the outdoor Terrace Lounge, will smoking be permitted.